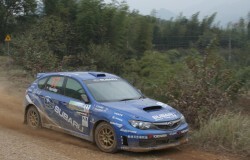 For the second year in a row, Dean Herridge has guided the Subaru Rally Team China to victory at Rally China. 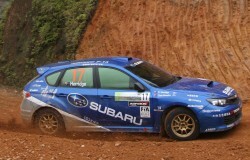 On track to second in the CRC field, Dean and the SRTC Impreza were elevated to the top-step of the podium when Englishman David Higgins was disqualified after he was allegedly assisted by another car after stage 14. “I’m very pleased with the way the weekend turned out”, said Dean after the podium ceremony. “It’s the biggest event on the Chinese rally calendar. So to finish second outright and first for the CRC after three and a half hours of rallying, it’s a very satisfying feeling. It was a bit unfortunate for David (Higgins) to be excluded in the way he was, but these things sometimes happen in rallying. It’s been a bit of a tough year for our team, so this is a great reward for all our team and the effort they put into every event”. The series international event, the CRC regulars were joined by a strong field of Asia-Pacific Rally Championship contenders. Not only was Dean first of the CRC cars, he was second overall with former team mate Cody Crocker cruising home for his sixth victory of the APRC season. “There were just two stages used today, and during the first pass of the roads were dry and in good condition. But it started raining during the second pass and with all the loose gravel having been swept from roads, they became very slick and difficult. Then later in the afternoon, on the big mountain stage, the middle section was very foggy. With 50-odd hairpins, you need to be pretty accurate on that stage. So the lack of visibility was a real problem”. As was the case in 2008, the Longyou event extracted a heavy toll of retirements.First to go was Juha Salo who retired on stage 2, then Jari Ketomaa punctured and lost time on stage three. Both Jussi Valimaki and APRC driver Hiroshi Yanagisawa stopped on stage four, Valimaki with electrical problems and Yanagisawa with a damaged oil cooler. Next to go was Gaurav Gill, who struck engine problems on stage five, while his team mate Katsu Taguchi pulled out on stage nine with a bent lower control arm. Alister McRae’s Proton S2000 had finished leg 1 in fourth, but suffered mechanical problems on SS13, Emma Gilmore hit a rock on stage 11, the impact braking her hand, while Dean’s team mate Li Wei crashed out on stage 13 while leading Chinese crews. The Chinese series now has a months break before the season-ending Rally Shaowu, which commences in the 18th of December. This entry was posted on Monday, November 16th, 2009 at 2:06 pm.